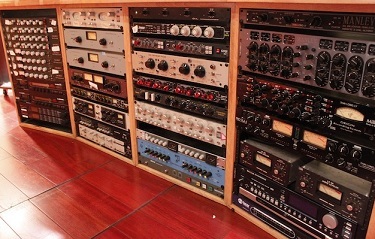 Musical "outboard equipment" or "gear" is used to alter how a musical instrument sounds. Outboard, (external effects processing and dynamics processing) can be used either during a live performance or in the recording studio. The term "outboard" was originally used to describe a piece of audio equipment that existed outside of a studio or venue's primary analog mixing board. Today, analog effects are also considered "outboard" when used in conjunction with console-free computer-based digital recording systems. Famous examples include UREI's analog dynamic range compressors, such as the LA-2A and 1176, early multi-effects units like those made by Eventide, and physical or digital reverb processors invented by EMT and Lexicon. -Dynamics processing units: compressors/limiters, noise gates time-based effects units: reverb, flanging, delay, echo, chorus etc. Do you have content, to add, about Outboard Recording Equipment or associated topics? Please feel free to Share it, here!